Our neighbourhood, or bairro, is called Pena and begins at the north-east corner of the Rossio, arching up to the large tree-filled park known as Campo dos Mártires da Pátria. On the southern tip of the Arroios parish, Pena is a family neighbourhood, home to the Italian Embassy, German Embassy, grassy parks and ponds… and the birthplace of Amália Rodrigues. 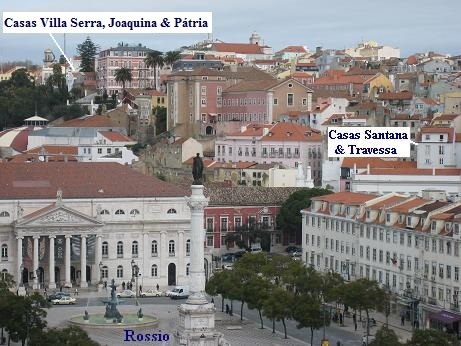 The map below shows the triangular neighbourhood of Pena, bordered by the Avenida de Liberdade on the left, Rua da Palma (R.Palma) on the right, and the Campo Mártires da Pátria at the top, with the Rossio at its bottom point. That said, if you live or are “sight-seeing” somewhere that doesn’t receive these unobstructed Atlantic breezes, the heat can build up and be oppressive. No matter when you visit: pack a sweater or light jacket. 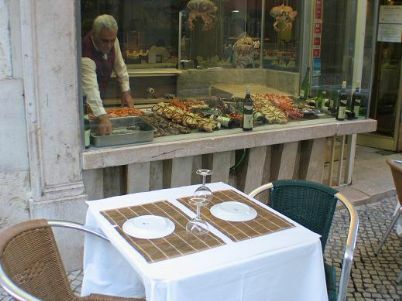 Pena also hosts Lisbon’s open-air Restaurant Row, Rua das Portas de Santo Antão, a pedestrian-only boulevard devoted to gastronomical indulgence. Popular favorites include the Michelin-rated Gambrinus, Solar dos Presuntos and Bom Jardim. The first funicular in Lisbon, Elevador do Lavra rattles up and down the hillside every 15 minutes, every day. Soon you’ll be riding like a local, cheerfully showing the tourists how and where to punch their tickets. 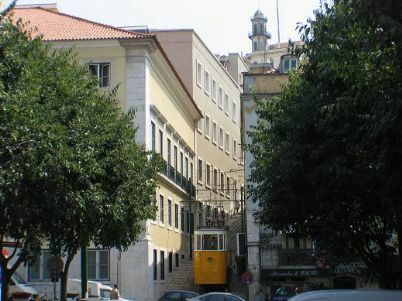 In the picture, below, Elevador do Lavra is at its lower stop on the end of Rua das Portas de Santo Antão. 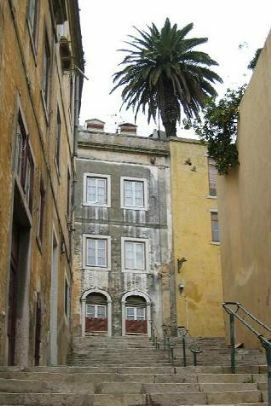 This meandering 14th-century stairway — with its famous 186 steps — is another favorite way to bop down from Casa Villa Serra, Casa Joaquina or Casa Pátria to the Rossio. 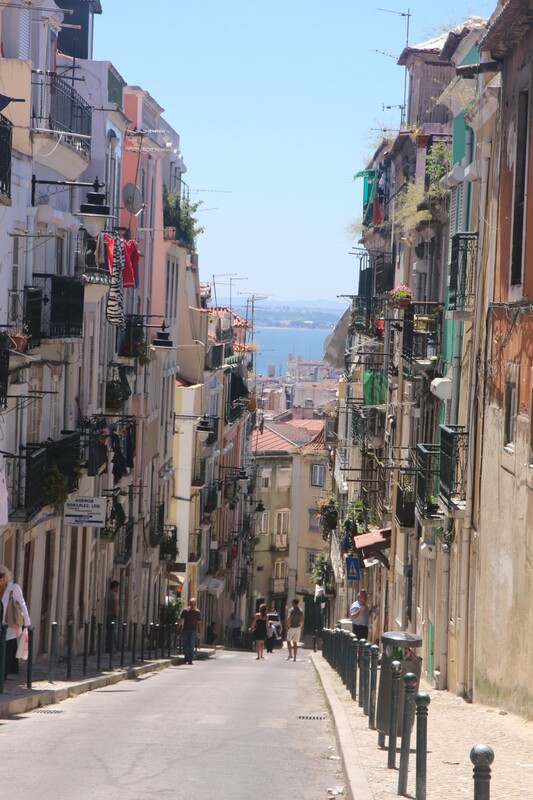 Lisbon is criss-crossed with these medieval thoroughfares: we encourage our guests to spend an enjoyable day wandering the city along these lanes, accompanied by the beat of Lisbon’s ever-flapping laundry. 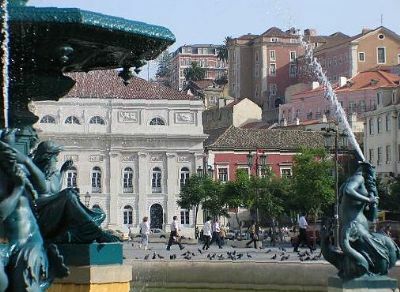 And here we have Lisbon’s Rossio square, with the imposing, white Dona Maria National Theatre guarding the entrance to Restaurant Row. Our neighborhood, Pena, is in the background.